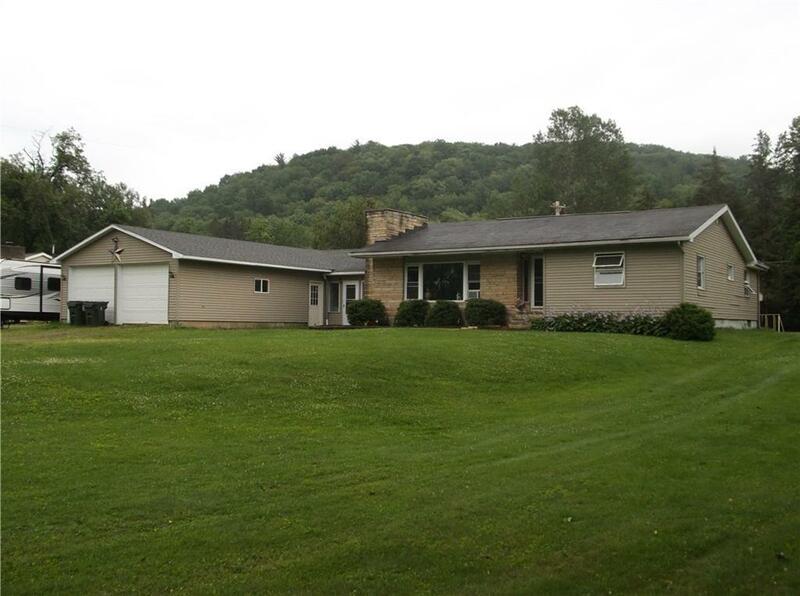 Check out this well maintained 2-3 bedroom, two bath ranch style house situated on a large lot just minutes from Olean or Allegany. The extremely large Living/Dining room features a working wood burning fireplace which was updated 7 yrs. ago and to the rear of LR is a cozy dining area overlooking the large back yard. The kitchen features spacious counter tops with plenty of cabinet space for all your cooking needs. Just off the Living/Dining area are two spacious bedrooms and bath. Located at the opposite end of the house is a two car attached garage (built 7 yrs ago), a bedroom, and two large finished rooms with separate entrances and laundry room (currently being used as play room and office space) which could also be used as separate living space. Other updates include new furnace (2yrs), new hot water tank (7yrs) and new drainage around the house.